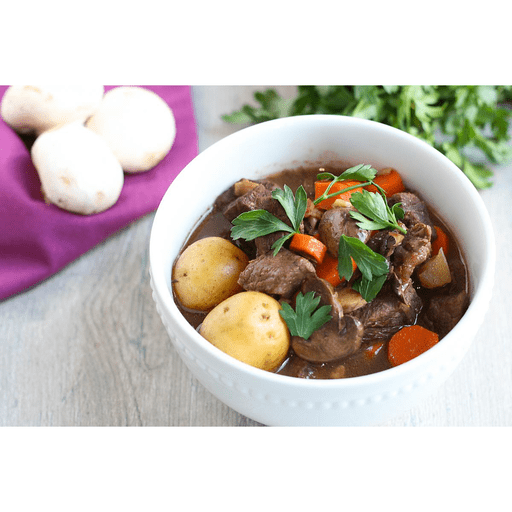 Impress your family and friends with this easy Slow Cooker Beef Bourguignon recipe. This classic labor-intensive French dish is simplified with familiar ingredients and the use of a slow cooker. That means you don't have to spend hours in the kitchen chopping, stirring and doing dishes. Win-win, right? 1. In a large skillet over medium heat, cook bacon until crisp. Transfer bacon to slow cooker. Discard all but 1 tsp. of bacon fat. Season beef with salt and pepper. Add beef to skillet with reserved 1 tsp. bacon fat and sear on each side until browned, about 1-2 minutes per side. Transfer beef to slow cooker. 1. Add red wine to skillet and stir, scraping up the browned bits on the bottom and sides of the pan. Allow wine to simmer and reduce for about 3 minutes. Slowly add in 1 cup chicken broth and whisk to combine. Sprinkle in flour and whisk until smooth. Slowly whisk in tomato sauce, soy sauce and remaining 1 cup chicken broth until well combined and no clumps remain. Add sauce to slow cooker. 1. Add garlic, thyme, carrots, potatoes and mushrooms to the slow cooker. Stir to mix. Cook on low for 6-8 hours or high for 4-6 hours, or until beef and vegetables are tender. 1. Ladle into bowl and garnish with fresh parsley before serving. For gluten free: Use gluten free all purpose flour in place of all purpose flour. Use tamari in place of soy sauce. Calories 620, Total Fat 39g (Saturated 13g, Trans 0g), Cholesterol 150mg, Sodium 600mg, Total Carbohydrate 21g (Dietary Fiber 3g, Total Sugars 5g, Includes 0g Added Sugars), Protein 40g, Vitamin D 0%, Calcium 6%, Iron 30%, Potassium 30% *Nutritional values are an approximation. Actual nutritional values may vary due to preparation techniques, variations related to suppliers, regional and seasonal differences, or rounding.